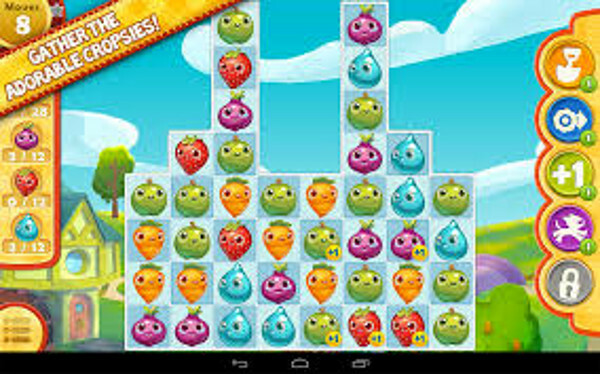 Funny thing about the world of mobile app/games - just when you think you have seen all that there is to see for a particular genre, the wizards who create games will surprise you by coming up with a new take on an established genre and leave you surprised! 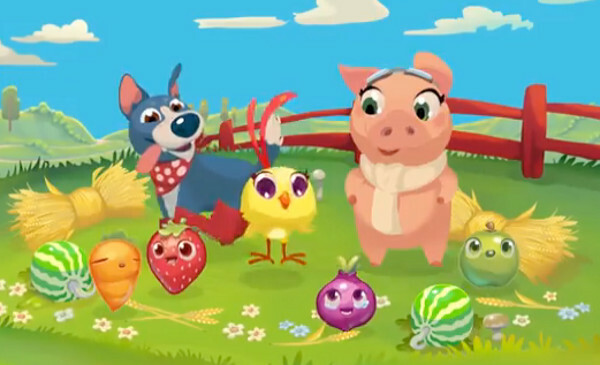 Farm Heroes Saga is a game that fits squarely and without question into the match-three and cascading puzzle genres. If you are anything like us, you are probably scratching your head and thinking: OK wait, now those are fun genres but really? Haven't we seen all that there is to see there? Well like Zombie games you can sometimes be surprised by a good fresh take on a well-established and, perhaps more important than that, a well-liked standard. 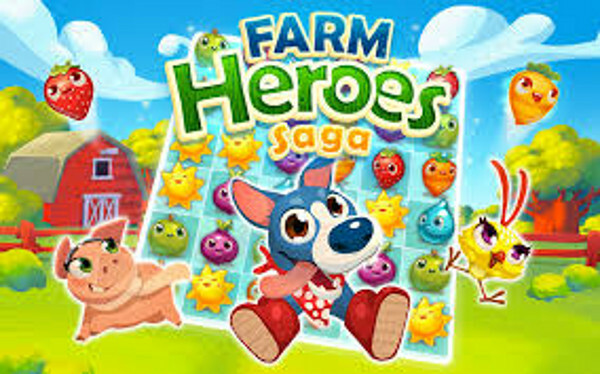 What Farm Heroes Sage brings is a fusion mixture of board-game style organization and a goal-oriented focus, making for a directed sort of game play that is at once entertaining and challenging. 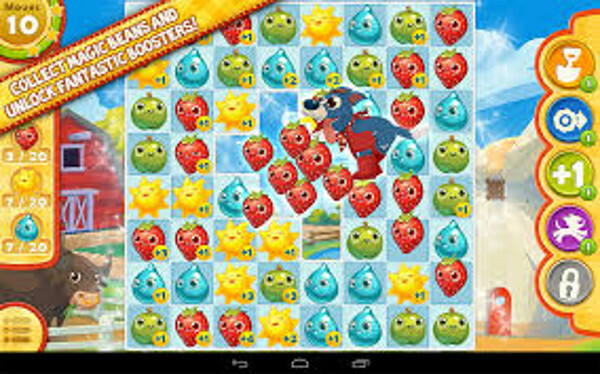 The game is free-to-download and free-to-play, and hits all of the high notes in terms of game connectivity - it is Facebook aware, and skips the annoying ad-heavy approach for a pay-as-you-need-to approach using Premium Currency in the form of Gold Bars that are used as the primary revenue stream. The Gold Bars can be purchased in variety lots - 10 @ .99 cents, 20 @ $1.99, and 52 @ $4.99 for casual play, with serious players able to obtain 214 @ $19.99, 556 @ $49.99 and 1259 @ $99.99. Now you might be thinking that seems like a steep cost, but it is not - because as long as you make the goal targets for a level, you don't have to spend any Gold Bars for that level. How that works - the game play - is simple and elegant. At the start of each level you are told what the target goal is, and how many moves you are being given. You have the option at the start of the level to purchase additional moves using Gold Bars if you feel the need - you start with 50 Free Gold Bars. When you get into a level and end up unable to hit the target goal in the moves you have, that failure costs a Heart. You have five Hearts - and each Heart will allow you to play. The neat trick here though is you don't actually have to BUY them - though you can. Your mates can actually SEND you Hearts in-game via Facebook so you can keep playing if you have bad luck. Finally there is an additional currency called Magic Beans that is a fusion of Premium and in-game - which is to say it can be won by play or purchased as you see fit or need to do. The different currencies come into play later, once you reach advanced levels and can purchase or recharge special action and utility objects. In short the in-game economics are well thought out and based upon a meritocracy rewarding skill rather than simply set up to force open the player's wallet, and that is so rare and so cool it is worthy of notice! 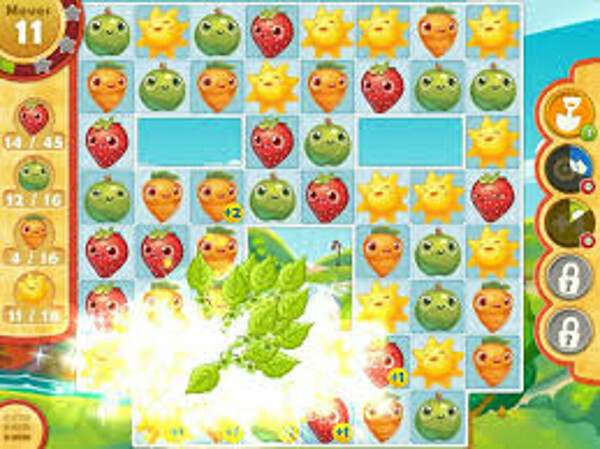 The graphics and sound in the game are both of significantly higher than usual quality for this sort of game in the sense that the wizards behind it did not simply shoot for eye-pleasing effects - which they did include - but a cute factor in robust animation and sound effects that grants the game a unique character and presence that was unexpected but happily encountered. Arriving at a conclusion for this game was a bit difficult - mostly because we couldn't actually bring ourselves to stop playing it. While that is a seriously great thing to say about a game you are telling gamers they should play, it is not so good when you know, you are supposed to stop playing so you can go play some other game and review it... Heh. One of the stand-out features that we would be remiss to fail to mention is the challenge stages of this game - where you face an enemy like an evil raccoon who you have to beat. You do that by spending some Magic Beans on bonus options to increase your capabilities in play. It is such a simple mechanism and yet it adds immensely to the entertainment value of the game. So after multiple sessions - just to be sure, you know, that this is as good as we think it is - and it is good like sliced bread is good - we are thrilled to have found one of the first five-star titles we have reviewed. Woot! For the hundreds of millions of fans around ..